The flipped classroom model is not a new concept for most ESL teachers. We’ve been flipping classes long before it became the latest trend in education, long before we even knew what to call it, understanding intuitively that students will not acquire a language by passively listening to an instructor’s lecture. Flipping the classroom happens naturally in conversation and reading classes, which lend themselves to class discussions or role-playing activities, or in writing classes, where students can spend valuable class time writing and peer editing. But what about grammar classes? This seems to be where many teachers get trapped in the common pitfalls of providing lengthy explanations and reading through a list of rules, followed by reciting answers to fill-in-the-blank activities. How can grammar teachers apply the flipped model to create engaging, dynamic lessons? Today’s flipped classroom typically requires students to watch online mini-lectures of instructional material, followed by interactive practice in the classroom, but it could just as easily require students to study from a textbook rather than watch videos. Most ESL textbooks are designed with this flipped model in mind, again not because of a conscientious decision to follow the latest trend but because of an understanding that language fluency is achieved through practice, not lengthy explanations. 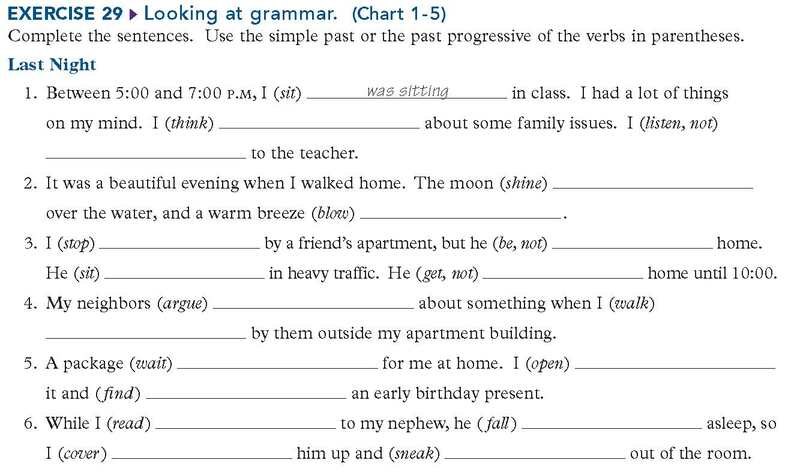 The Azar-Hagen Grammar Series works especially well for a flipped class because it presents the grammar in small bursts of instruction without requiring students to wade through long contextualized reading passages. Take this chart from the first chapter of Understanding and Using English Grammar. The explanations are presented clearly enough for students to learn the information on their own. There is no need for a time-consuming teacher explanation. I teach students early on that learning the material in the charts is their responsibility. I encourage them to copy the example sentences into a grammar notebook and to read them aloud several times. One of the biggest advantages of the flipped classroom is that it accommodates different abilities, allowing students to study the content at their own pace. If the textbook chart does not feel like enough instruction, there are plenty of video resources available, including the Grammar Coach videos on the MyEnglishLab component of the book and a YouTube series, EnglishWithStacy, presented by Stacy Hagen. Of course teachers can also record their own videos, keeping in mind that the instruction should be kept short, simple, and directly related to what will be practiced in class. As a follow-up to the videos, the so-called “drill and kill” exercises can also be assigned as homework. Long criticized for being a tool of rote learning and memorization, short chunks of mechanical practice are actually important in a language classroom. Drills build automaticity, and automaticity boosts confidence. While teachers often criticize these exercises, I find students usually beg for more. Here an example of an exercise students could do for self-study. Paul played a game on his phone. Paul was playing a game on his phone. If you can find song lyrics that illustrate the grammar point, that’s even better. John Lennon’s song “Jealous Guy,” for example, allows students to examine the simple past and past progressive. “I was dreaming of the past, and my heart was beating fast. I began to lose control. I didn’t mean to hurt you.” Why does Lennon switch from the past progressive to the simple past? Like teachers, students are tempted to read the explanation straight out of the book: “Both actions occurred in the past, but one action began earlier and was in progress when the other action occurred.” I’m happy they found the answer, but I’m far more impressed when they come up with their own explanations. My favorite came from Yuki, a shy Japanese woman, who said, “The past progressive is like the background of a picture. It sets up the scene, but it’s not the most important thing. The action in the simple past is more important, like the actual subject of the picture.” This type of metacognition helps students connect the instructional content to actual usage. Once students have demonstrated an understanding of the material, they need to practice using it as much as possible. As with driving a car, knowing how to do it is not enough. It needs to become automatic. This is where Understanding and Using English Grammar really shines. Each chart is followed by several speaking exercises, usually to be done in pairs. I have students talk with a partner for three minutes before moving on to a new partner and repeating the same activity. What were you doing at 5:00 a.m.? What did you do when you got home last night? Who were you texting earlier? Where did you live when you were younger? I was driving down the highway. I was listening to loud music. I wasn’t paying attention to my speed. Suddenly, I heard a siren. A police officer pulled me over and gave me a huge ticket. The students find a new partner and tell the same story again, but add one new detail. Then they tell their story to a third partner, adding one more detail again. By the time they’ve told their story three times, the students seem relaxed and comfortable using the verb tenses. 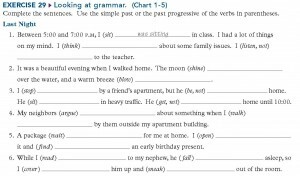 With teacher-guided practice, students are doing exactly what the title of the book claims: Understanding and Using English Grammar. Geneva Tesh is an ESL teacher, materials writer, grammar enthusiast, and contributor to the Azar-Hagen Grammar Series. 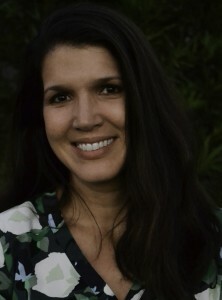 She teaches in the Intensive English Program at Houston Community College.